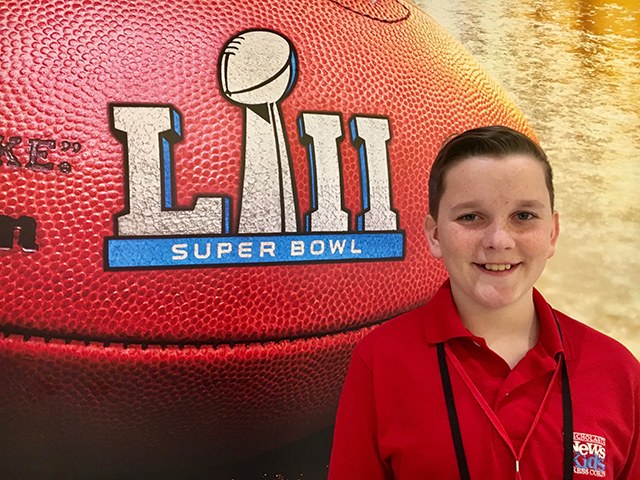 A Super Bowl to Remember | Kid Reporters' Notebook | Scholastic Inc.
Click below to see clips from Ryan’s interviews before Super Bowl LII. The Philadelphia Eagles beat the New England Patriots in Super Bowl LII, pulling off a stunning 41-33 victory. The megawatt matchup was held on February 4 at U.S. Bank Stadium in Minneapolis, Minnesota. Outside the stadium, the thermometer hovered around zero, the coldest temperature ever recorded at a Super Bowl. Fortunately, the stadium is enclosed, so fans could stay warm as the Eagles, the National Football Conference champions, battled the Patriots, the American Football Conference champs, in a gripping game. Ryan gets ready to report on Super Bowl LII. Ertz’s teammate, running back Jay Ajayi, agreed. “I definitely want to be a part of that,” he said. Ryan with Elandon Roberts, a linebacker for the New England Patriots, at a Super Bowl media event in Saint Paul, Minnesota. Several records were set during Super Bowl LII, including the most yards gained in an NFL game by both teams combined. The total was 1,151. The night before the game, New England quarterback Tom Brady, 40, became the oldest player ever to win the NFL’s Most Valuable Player (MVP) award. It was the third time that the future Hall of Famer won the distinction. Brady has earned five Super Bowl rings during his 18-year career. Although his hopes for a sixth ring slipped away in the final minutes of the game, he is arguably one of the best NFL players in history. During the Opening Night festivities at the Xcel Energy Center in Saint Paul, I asked Doug Pederson, coach of the Eagles, how he planned to counteract Brady’s legendary arm. At the end of the game, Eagles quarterback Nick Foles emerged as the unlikely hero. His outstanding performance earned him this year’s Super Bowl MVP award. Days before Philadelphia’s victory, the first-ever Super Bowl win for the franchise, Foles told me that he had actually considered quitting football two years ago. He decided to persevere. Foles said that he enjoys talking to kids during the off-season. He reminds them that struggles are a part of life for everyone. “It’s so easy to look at Instagram and see all the highlight reels of people’s lives,” he said. On February 8, just days after the Eagles’ epic victory, Foles and his teammates celebrated amid triumphant fans at a parade in downtown Philadelphia. “It’s the quintessential year for the Eagles to win,” one fan told a reporter. “No one expected us to win.” Perhaps not even Foles.